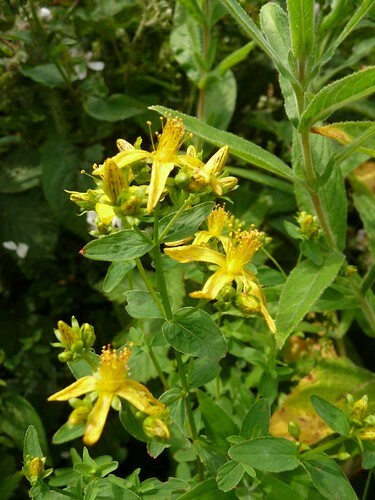 St. John’s Wort flowers around midsummer. If you rub the leaves between your fingers you can smell a back-of-the-nose heat. It is sunshine in plant form, bringing calmness to the nerves and yielding a bright red colour, both in dyeing and when soaked in oil. It is of the oil that we wish to speak. This bright red liquid will help to heal bruises, sprains, burns, skin irritations, or any wound that involves nerve damage. Gather the top 6 inches of the plant when in flower. 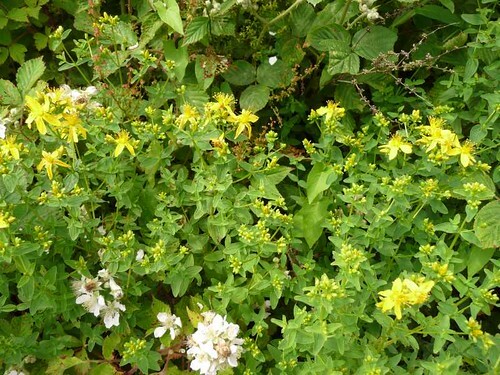 Do this as close to midsummer as possible for optimum potency (ie.now). Get yourself some good oil that you wouldn’t mind smearing on your skin. Almond oil is good and other nut oils will do well. If you want to splash out use hemp oil. We will assume you want to make a half pint of the healing unction, but it is your choice, depending on how much you or those around you get injured. 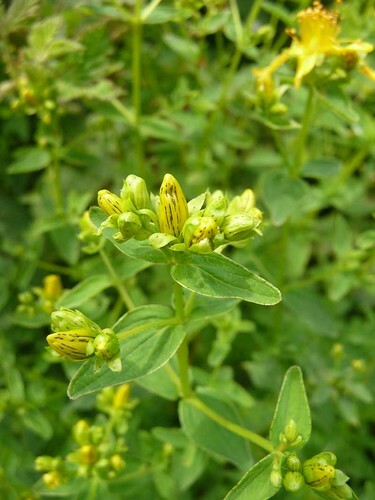 Lightly pound the flowering heads, leaves included, in a mortar and pestle to release the juices. Put the plant into the half pint glass container of oil until there is hardly any more space, making sure that all plant material is covered by the oil. Put a cork or lid on the bottle and leave it in the sunlight for 40 days (and 40 nights). Give it as much sun as possible. Every few days give the bottle a slight jiggle around. Watch it go more and more red. 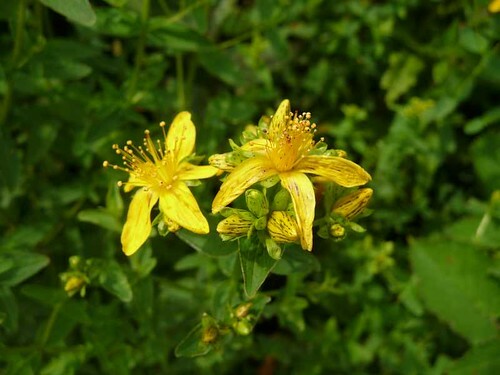 When the month is up and the oil is a deep bright red colour, strain the plant matter from the oil and you are left with a healing ointment for applying to burns and bruises and cuts and inflammations. If you feel it is the type of injury that needs treatment with sunshine, such as a nerve rending cut or a burn on a kettle, apply this oil, coating the injured area. We were told in a comment below that the oil on skin can cause photosensitivity so when applied it is best to avoid direct sunlight on the injured part. Make sure you clean the container before you start and you and the injury are clean before applying the oil. 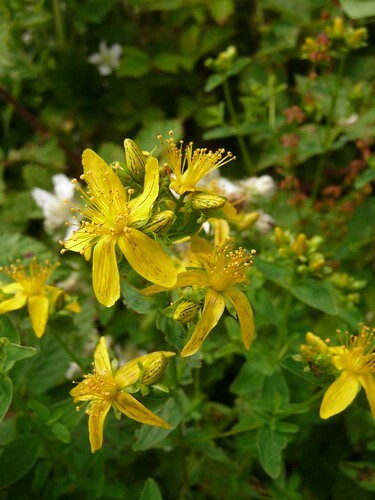 There is much more information in the St.John’s Wort Profile. Please have a look to find out more. They are here right now gracing our hedgerows and rocky ground. A summer treat for the sharp of eye. Leave enough for the birds to spread the seeds around. We like them with oats in the morning.